The Asia-Pacific Trade and Investment Report (APTIR) is a recurrent publication prepared by the Trade, Investment and Innovation Division of the United Nations Economic and Social Commission for Asia and the Pacific. It provides information on and independent analyses of regional trends and policy developments in trade in goods and commercial services, as well as foreign direct investment. It also provides insights into the impacts of these recent and emerging developments on countries’ abilities to meet the challenges of achieving sustainable development. The theme of APTIR 2017 is Channelling Trade and Investment into Sustainable Development. 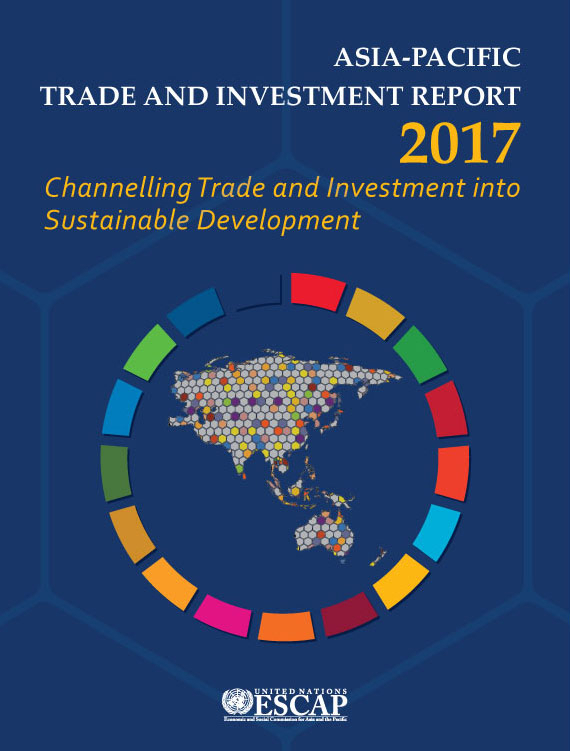 The Report proposes a framework to further enhance the contribution of international trade and foreign direct investment to sustainable development. The Report also provides estimates of the economic, social and environmental impacts of alternative regional trade and investment liberalization policy scenarios, when implemented alone or in conjunction with selected domestic social and environmental policies. The report is aimed at policymakers as well as practitioners and experts, academia, business, international agencies and non-governmental organizations working or interested in trade and investment issues in the Asia-Pacific region.